Learn how to bend sound to your will with the Noise Pack add-on for the Kitronik Inventors Kit for the BBC micro:bit. The pack, in conjunction with the Inventors kit and a microbit, contains all you need to build the 5 exciting experiments contained within. You will learn how to build and code musical instruments, amplifiers, and EQs, including High and Low Pass Filters (HPF/LPF). Who needs expensive Pultecs or Console Channel Strips when you've got some components, a microbit, and some know how! 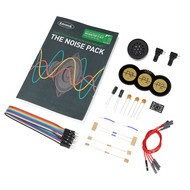 The pack brings together electronics and code in the most noblest of causes, making noise! We're going to make a noise and then we're going to amplify it! A fun and exciting add-on pack for the Kitronik Inventors Kit for the micro:bit. Learn how to manipulate sound, build instruments, amplify your sounds, and how to shape your sounds with Filtering and EQ. Varying The Tone With A Piezo Buzzer. 3 x 100nF Ceramic Disk Capacitor. 2 x 1µF Electrolytic Capacitor. 2 x Finger Adjust Spindle. 2 x Solid Core Connecting Wire. 10 x M/M Jumper Wires. 1 x 0.15W 8Ω Speaker. 4 x F/F Jumper Wires. 1 x NCP2890 Audio Amplifier IC Breakout Board. 1 x 3 Key Touch PCB. 1 x Tutorial Booklet, containing 5 experiments. An Inventors Kit for the BBC micro:bit. Noise Pack add-on microbit Guitar Free resource..